"Discover How To Systemize & Streamline Your Entire Online Business So You Can Have More Free Time While Still Growing Your Business"
How to systemize your business and expand it by leaps and bounds. Imagine a business that has complete automation and control? How much more time and money would you be making? 4 lessons you can learn from the best-selling book called The E-Myth. It teaches you how to work ON your business instead of working IN your business. These invaluable lessons will surely make you think twice about your business. How McDonald's leverages on the power of systemization to become one of the most popular franchises in the world, and how you can apply it too. How to start creating systems that run itself. I'll share with you the tools and techniques to document and record every aspect of your business so you can simply hand it to your staff or outsourced worker and they can follow the system you've created. How to leverage on other people's skills to streamline and automate your business like never before. This is the smartest and easiest way to grow your business. How to spread the word about your business so you can gain more leads and sales which means more money in your pocket and plenty of time for your favorite hobby. Simple little techniques to systemize your business without breaking a sweat. In the end, you'll have a more organized way of getting things done instead of being all over the place! ...all because you have systems working for you like machines! Yes - You may resell this product. Yes - You may sell/pass resell rights/master resell rights to this product. P.S. Stop doing all the work yourself. 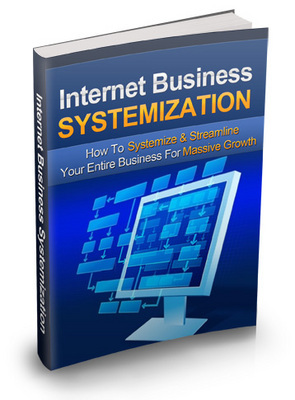 Discover how to truly grow your business using the power of systemization. Order today and grow your business sooner!